What happens if there are multiple “Destroyed:” effects on the creature with Armageddon Cloak? If there are multiple “Destroyed:” effects, the active player chooses the order of resolution. 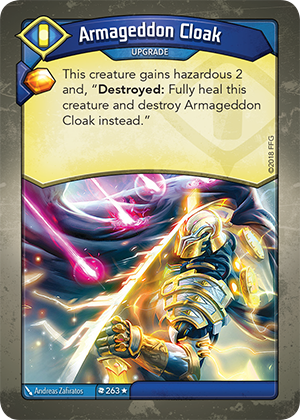 And if Armageddon Cloak triggers first, thus healing the creature and destroying Armageddon Cloak, the creature is no longer considered to be destroyed or leaving play, so other “Destroyed:” abilities do not trigger. What happens if I play Armageddon Cloak on a creature that already has the Hazardous keyword on it? Can I play Armageddon Cloak on an enemy creature, allowing me to gain the Æmber bonus? Yes. The first step in playing any card is to receive the Æmber bonus, if any. Then, unless otherwise stated, an upgrade can be played on any creature, including enemy creatures. Therefore, you could play Armageddon Cloak on an enemy creature to receive the Æmber bonus. If there are no creatures in play, can I still play Armageddon Cloak to gain the Æmber bonus? No. If an upgrade (such as Armageddon Cloak) cannot attach to a creature in play, the upgrade cannot be played. Therefore, you could not play Armageddon Cloak if no creatures are in play and no Æmber bonus could be gained. If a creature with Armageddon Cloak is attacked by a creature with the Skirmish keyword, does the attacker take damage from the Hazardous effect? Yes. Hazardous damage can be used to harm attacking creatures with the Skirmish keyword. The Skirmish keyword only protects an attacker from damage during a fight (i.e. when damage from creature power is exchanged), and doesn’t prevent damage from other sources, such as other keywords or card abilities. If Hazardous damage – which takes place before a fight – destroys a creature, the fight does not occur.